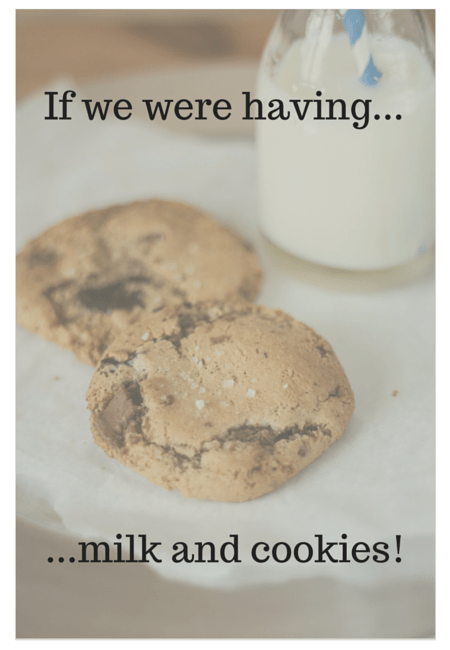 Another month, another milk and cookies date! I really look forward to these catch-ups because they give me a chance to chat without aim and release all of the disconnected thoughts in my head. Thanks in advance for listening! With that, let’s sit down and enjoy some soft ooey gooey cookies and a tall glass of [almond] milk. A big hug would be in order (duh)! And instead of chatting about the small things first, we would just start with whatever’s on our mind and go with the flow. I would tell you all about how Darya Rose, the author of the blog Summer Tomato, recently started a podcast called Foodist. If you like learning about other people’s health journeys, definitely check it out. I love Darya’s realistic, no-nonsense approach to achieving a healthy lifestyle. We would then inevitably chat about the weather, and I would tell you how evening walks are back in my life! While it’s too freaking hot to go outside at any other time of the day, the temperature around 6 pm is perfect (IMO). And with the sun not setting until almost 8 pm, I have no excuses not to get out! Social media would be on our minds for some reason, so we’d move on to a discussion about our favorite channels. You’d tell me Pinterest is where it’s at, but I would disagree. For me, it’s all about Instagram and Snapchat. Yes, the thing I joined last is quickly becoming my favorite. I love how Snapchat incorporates pictures and video and how nothing is permanent. The casual feel is also great…share whatever you want, whenever you want. Pretty awesome! The built in chat feature is convenient too. So much to love. After going on and on about Snapchat, I’d finally convince you to join and follow me (@myinnershakti) of course! But don’t lie…the crazy selfie filter feature is what really drew you in! Obviously food would be next on the list of things we talk about. I would share with you that I’m still on an egg + avocado + feta + sriracha + sourdough toast kick. SO DAMN GOOD! And it literally takes five minutes to make. I’d also share that my favorite afternoon snack as of late is Greek yogurt + PB. However, if you’re anything like Vishnu, you’ll think that’s a really gross combo. But I don’t find that to be the case, so it’s worth mentioning! After talking about some of your recent food obsessions, I’d share a story about how I experienced the power of humor at the grocery store the other day. My usual experience at our local Publix isn’t always a great one. So I was pleasantly surprised when the lady behind the deli counter joked with me, a vegetarian, about buying turkey for my husband. It seems like such a silly thing to remember, but it made the rest of my shopping experience + the rest of my night a lot lighter. Regardless of what we do for a living, I think humor and fun are absolutely key. Travel would come up next like it always does. I’d tell you that I’m not travelling again until the end of the month for our Chicago house hunting trip! Eep! The funny thing is that I’m not at all nervous about the whole process, and that’s probably because I’ve gone through it a million times now. But in all seriousness, fingers and toes are crossed that we find what we’re looking for. I’ll share more when we meet again next month! And finally, with a few minutes to spare, you’d ask me about my sister’s wedding and how all that is coming along. I’d tell you that the excitement is getting real now, especially with less than two months to go! I’m currently in charge of the RSVP list, and I can’t help but smile every time I think about seeing our family and friends in June. But even before the wedding, we have Aekta’s med school graduation that both Vishnu and I are flying home for! I still remember attending Vishnu’s graduation last May. It was such an emotional day, and I know this will be the same. Can’t wait! With that, it’s time to go…until next month that is! So tell me, what’s going on in your life right now? Any big summer plans? Oh we are! While moving is going to be undoubtedly stressful, I can’t wait until we’re settled in Chitown! Loved following along with your trip on Snap! I’ve been doing various forms of egg toast all the time lately myself. My current obsession is whole wheat toast with meunster cheese, wilted spinach and a runny sunny side up egg. So good! I also don’t think pb + Greek yogurt is weird at all. I need to get back to snacking on that goodness! You’ll love Snap once you get the hang of it. It took me a little trial and error too! And I love that combo! Muenster cheese and it’s salty goodness is perfect with eggs.